The first adjective that comes to mind when I see this plant is "tousled". In fact, the Common viper's Bugloss has several "hairy" features, hairs on the stem, on the peduncle and on the sepals, stamens and forked style emerging from the flower, inflorescence forming scorpion tail, everything for a "disheveled" look. 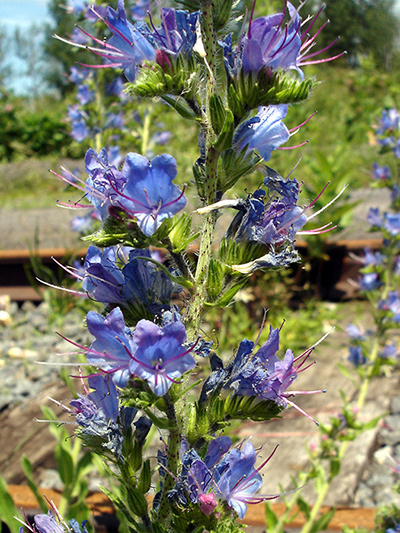 Some parts of the plant are reminiscent of anatomical features of vipers (Echium: viper in Latin), also this plant is a good example of the doctrine of signatures, see the section Ethnobotany for more details. The Common viper's Bugloss his a biennial introduced and very melliferous plant, it attracts bees, butterflies and bumblebees. Grown in physic gardens (medicinal plants gardens) at the time of Nouvelle-France.